Our personality for this week is the Ika born Rt. Reverend Godfrey Ifeanyichukwu Ekpenisi, a clergy of the Church of Nigeria, Anglican Communion, who was recently consecrated at Abuja for Ika Diocese and will be succeeding Rt. Revd Dr. Peter Imohna Onekpe who is retiring in December. His enthronementas the first indigenous Bishop of Ika Diocese by the grace of God comes up on 15th of December, 2018. I am Rt. Reverend Godfrey Ifeanyichukwu Ekpenisi. I hail from Oki, Agbor, Ika South LGA, Delta State. I was born on the 26th of January 1969, into a family of seven children to Mr. Edward Amadi Ekpenisi and Ezinne Esther Nwocha Ekpenisi in Agbor. I am the first son and the second child of the family. My father served in the Nigerian Army during the Nigerian Civil War and later worked at Asaba Textile Mill. My father died 26 years ago, while my mother is still alive. She is a retired school teacher and hails from Owa-Ekei, Ika North East. How was your growing up years like? I was brought up in the Anglican Communion. During the Civil War, we took refuge at my grandmother’s place at Owerre-Olubor; my paternal grandmother is from Owerre-Olubor. Immediately after the war, we went back to Asaba, where we were residing before the war. My parents were both working at Asaba Textile Mill. I grow up right there at Asaba and I attended both my primary and secondary education at there. I had my secondary education at St. Patrick College, Asaba between 1979 and 1984. I grew up basically around the bank of the River Niger, Cable Point to be precise. We spent most of our days and times after school at the River Bank, where we farmed and also had to do some fishing. After my secondary education, I went to Teachers’ Training College, that is St. Thomas Teaching Training College, Ibusa. I left Teachers Training College in 1987. My mother later resigned from Asaba Textile Mill in 1975 and went to Teachers’s Training College Auchi, from 1975 to 1979. She started teaching in 1979 and taught until she retired in 2007. I did my NCE part-time programme at College of Education, Agbor and graduated in 1994. I studied Mathematics, and I was the best graduating student and won the Provost Prize in the Faculty of Science and the Departmental prize. In 1995, I applied for study leave to study Mathematics at the University of Benin and graduated in 1997 and did the compulsory Youth Service in 1998 at Federal Government Girls College, Shagamu. After my Youth Service, I taught briefly at Ugbolu Primary School, Asaba, where I resigned for full-time ministry. I came into the church ministry in 1999 as a Catechist, and I was posted to St. Paul Anglican Church, Ishiagwu, near Ogwashi-Uku. I served under Ogwashi-Uku Parish as a Catechist for eight months and was sent to the seminary that same 1999. I read Theology at St. Paul’s College Awka and graduated in 2001. I was ordained deacon in 2001 and later ordained priest in 2002. With your outstanding performance in academics, one would have thought that you would continue in the academics? Actually, academics is even in the church, I studied Religion and later Theology, that is where the academics is. In the earliest time, scholars were clergymen, so we have to continue the study and we are still studying. The interest in academics is still there. How were you able to combine academics with church activities? Generally, the moment you stop learning, you start dying because it causes retardation in your brain and so affects the entire body system. Any school teacher, church teacher or clergyman who refuses to study and build his life will have problems, and it will affect his work. The world itself is progressing so if you do not study, you will be left behind. We therefore have to keep learning and developing. Studying is helpful and we will continue to study. What actually inspired you to join the full-time ministry as you were doing very well in your teaching profession? I rose to the position of Assistant Headmaster in the Institute of Continuing Education, Asaba. I was doing well in teaching. However, I must give a lot of credit to my mother who ensured alongside with my father that my siblings and I were baptized in 1975. It was like bringing us into the fold of the Anglican Church. We were regular in church services and played our parts as children and at the age of thirteen in 1982, I was confirmed by the then Bishop of Asaba, Right Rev’d. Dr. Roland Nwosu of blessed memory. That confirmation brought me closer to God, and the church as well gave me an opportunity to serve as a cross-bearer, member of the choir at All Saints Church, Asaba and then I joined the Anglican Youth Fellowship. I participated actively in various church activities during my early days. I was zonal leader of the Evangelical Fellowship of Anglican Communion (EFAC). I was also Youth leader, Anglican Youth Fellowship (AYF), senior prefect, St. Thomas’s College, Youth President of All Saints Youth Fellowship, University of Benin, among others. When I came back from present Edo State to Delta State, I worked at Okpanam, where I served as Youth Leader Fellowship (AYF) for seven years. Then in 1994, I was elected President of EFAC in the Diocese; that is, the whole of Anioma and Ndokwa area, for six years. All these positions brought me very close to God. In the midst of all these services, it became clear that the Lord wanted me to come into deeper service for Him. First, I was working with the government but it was becoming clear that I needed to go into full-time Ministry. The calling was clear as well as the message, so I had to pull out from the Public service. I retired voluntarily and came into full time church service. And it was at this time that I had to come in as full-time catechist. What was the reaction of your family to your going into full-time ministry, being the first son? First of all, I have a friend whose mother gave birth to three sons and the whole three of them are in the priesthood. Our present Bishop of Bendel Province has three of his sons in the priesthood. So, for just one person, we have not even given enough. We are three sons and just only me a priest is not even enough more or less to complain. The acceptance of my going into full-time ministry was total. Though some colleagues in the teaching profession felt that I was making the wrong decision because they did not have the understanding of what it means to answer the call. They felt that I should not be leaving teaching the profession at a time it was becoming very juicy. The call is not a function of money but a function of service to Christ. Is there a particular incident that led to that turning point of your receiving Christ? 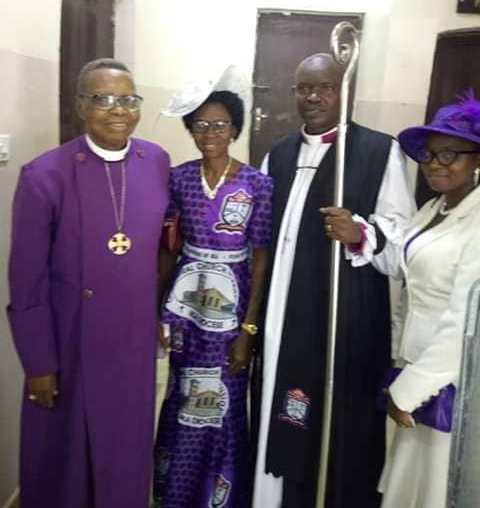 In 1998, the then Bishop of Asaba of blessed memory organized what he called ‘Asaba Diocese for Christ’ and invited some clergymen to minister, and share the good news. And by the grace of God, a lot of us received Christ in a new way from that ministration, and determined to serve God. So, that one-week programme was a turning point not just for my life but for many others also. In addition, many of my contemporary clergymen today in Asaba Diocese, Ika Diocese and Benin Diocese can trace their roots to the late eighties (1987-1989) when God used the late Bishop to turn their lives around. We have not remained the same again after that particular programme that came to change lives. Obviously you are a teacher by profession, can you please give us your candid evaluation of the Teaching profession in Nigeria today? It depends in how we want to assess it. In those days, there were things that made it better then than today and today, there are other things that make it better than in the past. But then, on the whole; family life, the society, the teachers themselves, government, students, parents etc. they all have roles to play in teachers’ overall performance of the teacher. They are stakeholders that affect the overall performance of teachers, so we cannot entirely say the teaching profession of the past is better than the present. Is the dignity of the teaching profession still intact or it is diminishing? The dignity of the teaching profession is still intact but the society may not have contributed the much that it is supposed to towards the teaching profession. Teaching may not be what it is supposed to be. This is because as the world is moving, it is expected that the profession should move along. This has to do with what they are being paid and other factors. But notwithstanding, the teachers are still keeping on. We are supposed to have a better classroom now and better facilities in our classrooms. Today, teaching has gone beyond the chalkboard to the whiteboard and we should move on to the interactive board. There are certain things that may tend to reduce the efficiency of the teacher, as the society is growing and with it, a lot of changes. Some of these things are also influencing the lives of the children. For example, when we were growing up, when you commit an offense, the teacher will flog you. But today, if a teacher flogs a student, the parents would come to slap and beat up that teacher; sometimes the teacher is even arrested. All these have reduced the capacity of the teacher to do much. But in the midst of all that, teachers are still holding on, they are still teaching and they are still doing great. Was there any struggle in your decision to leave the teaching profession for a full-time ministry considering the financial disparity? There was no struggle in me. Satisfaction is not based on how much you are earning, contentment makes the difference. Money was not an issue for me because coming into the ministry as a priest and serving the Most High God. I did not have issue with leaving teaching also because I am still teaching. So the issue of being in the profession and leaving the profession does not come in here. I still teach in the church and in the classroom. For instance, I served as the principal of Mary and Martha Juniorate, Igbodo and in 2010, I was transferred to serve as vice principal in a school in Abuja; Anglican Girls Grammar School, Abuja for eight years. During this period I taught Mathematics and Further Mathematics. In the true sense of the word, I never left the teaching profession. Aside my NCE Certificate from College of Education, Agbor, I also got a degree in Science Education in Mathematics from the University of Benin, and then a Master’s Degree in Educational Administration in 2014 from University of Benin. I am still very much in the teaching profession. What are the challenges in your ministry? Certainly everyone has one form of challenge or the other, but for me, the Lord has been faithful to be sincere. I have served in communities here. I served in St Peter’s, Boji-Boji Owa in 2001, Ebenezer Church, Ekwuoma between 2002 and 2004 and St. Barnabas Owerre-Olubor between 2005 and 2007 and a lot of other places. In all, God has always gone ahead of me, so it has been all seasons of blessings and grace. Not that I do not have challenges, it is just that God has always helped us to surmount them. The fact is that His grace has been sufficient for us all through the years. I will rightly say that I am a product of God’s grace. It is notable that your pastoral service has witnessed numerous transfers. What could be the reason (s) for this? My transfers have always been out of necessity or need. Whenever there is a place that somebody is needed to step in and put things right; I will be called upon. This has resulted in my movement from place to place, and God has always given us success. We are just instruments in the hands of God. Sir, what is your advice to other priests? My advice is that we should all make effort to touch the lives of people. Every opportunity given to a priest, a teacher and others in every walk of life should be used to positively touch the lives of the people they are called to lead and serve.